Maconomy has released a project-management and time tracking software application for agencies and is promoting it with a flash game. Their website promises: "The Maconomy Time – on Time concept enables you to capture employee time in an accurate and timely manner enabling increased invoicing and a better follow-up on job estimates." Judging by the screenshot, the program still requires humans report their activities manually, which still doesn't solve the main problem - the human factor bottleneck. After all, it takes about the same amount of self-discipline to record your time on a piece of paper or on a computer screen. 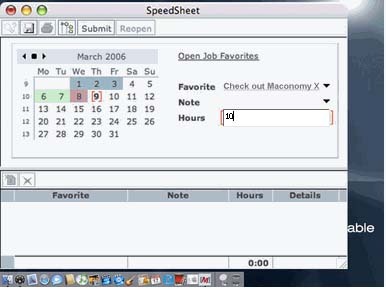 The aggregation and analysis of time sheets has been automated before; what's needed now is a system that recognizes the task you are working on at the moment and puts it in the right job-number bucket automatically so that you don't have to input anything yourself. Here are a few thoughts on how that can be done. For the tasks that are being performed on the computer - preparing powerpoints, writing, doing layouts - the solution would be fairly easy to implement by adding an extra "wizard" layer over common applications that would require a job number each time you open an application or create a new document. Then, each time you open the same file , the system would already know what project you are working on based on the assumption that a particular file is a deliverable for one particular task. The more difficult problem is automating time tracking for tasks that happen away from the computer - meetings and phone conversations. For meetings that happen in conference rooms (presumably, those are the longer meetings), you can have an electronic room reservation system coupled with card readers at the doors. Whoever reserves the room for a particular time slot would also input the job number, and then sliding your access card on entry and exit would work as clocking in and out for this particular task. Counting time spent in ad-hoc meetings at someone's desk would be more difficult, but that could be reported as a pre-set percentage estimate instead. To track time spent on phone conversations, you could set the phone system in a way that would require users to input the last two digits of the job number before making a phone call, although that's definitely not the most graceful solution. Perhaps, the time spent on the phone could also be a pre-set estimate from the beginning, at least for the jobs that are not phone-intensive.